The foreign language radio output at the time when the two DAB services were available as well. with a lower power and poorer antenna strength at the Espoo transmitter site. 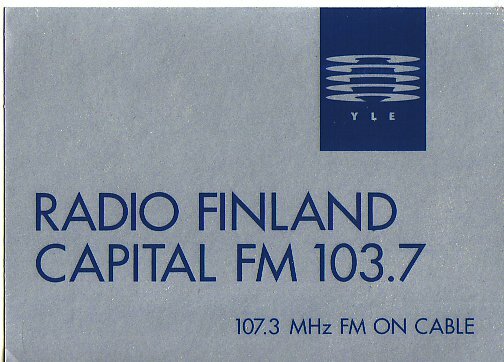 In Mid-November 1991 YLE Radio Finland, the international radio service of YLE, launched a domestic station based on relays of leading international broadcasters as well as its own output, primarily produced for listeners abroad. Formal (legal) restrictions against being available domestically had never existed, but due to the propagation situation YLE Radio Finland had no domestic audiences until the mid 70s. In 1977 air time had been given on two domestic MW stations and in 1978 a low powered FM was started in Helsinki, for relay the foreign language segments of YLE Radio Finland. While the medium wave stations were intended to be listened in neighbouring countries, the FM was rather acquired as a platform for control. Members of the parliamentary control body could listen and find out what the external service was doing. It was that "control FM" that was developed first as a temporary foreign language transmitter with special extended YLE coverage of events such as the 10th anniversary of the Helsinki Summit in 1985 - with president Ford returning to Helsinki for the occasion - and the Helsinki Summit in 1990 between George Bush and Michail Gorbachov. With placement on local stations becoming very common, the idea was developed in the YLE external service to fill in the gaps in the schedule with foreign programming. The BBC (Finnish Section) had become a part of the format of many Finnish commercial stations, and the same could be applied to the external service FM, in English. However, YLE was not prepared to pay for any programming. I took up the plan - with emphasis on our inability to pay - at a meeting of broadcasters hosted by CBC in Hamilton (Ont). And it appeared to be feasible. The plan was given a go-ahead by YLE Board level in late summer 1991 - and following the fast installation of satellite receivers and a somewhat elementary automation system, the service was started in November 1991. The first three programme providers were the BBC World Service, Deutsche Welle (in German) and VOA Europe. Radio France Internationale in French was added in early 1992. VOA Europe was also swapped for the VOA Worldwide English channel. VOA Europe was part of the programming of many commercial stations in Finland at the time and the more serious Worldwide English was considered more appropriate. YLE was apparently the first non-AFN station to use US public radio in Europe as FM placement. The program was the CSpan Weekly Radio Journal, a production by Beth Talesman for the CSpan audio networks. The feed comprised a telephone line from WAMU, but it was better than nothing. YLE also participated in the two week trial run of NPR in Europe and started using NPR when the service became regular. VOA remained as part of the Capital FM until - in 2001 - they themselves told YLE the service was being reduced and was no longer available. The English output on the Capital FM expanded later to include ABC Radio Australia and the South African SABC, both via the World Radio Network in London. Taken the fact that many Finnish pensioners had started spending winter seasons in Spain and Portugal, and having picked up some of the language at least, were keen on keeping abreast with news down there also while in Finland, an effort was made to bring in Spanish and Portuguese. The Spanish news channel, RNE Todo Noticias started in the mid 90s, but the Portuguese Radio was not interested. From Spain YLE wanted specifically the domestic news network, not the external service. The Finnish listeners would be familiar with the domestic news network, not with the external service. Efforts to include RAI were not successful, but as an alternative the Vatican Radio in Italian was obtained, with their weekday radio journal. For some years China Radio International (in English) was heard, available via WRN. Later Nordic languages, Danish and Norwegian were added, from the national broadcasters NRK and DR. The FM service had a low power frequency in Helsinki. For some years in the mid-90s parts of the schedule were heard also over stations in Turku, Tampere, Lahti and Kuopio and for a shorter period Jyväskylä. With the introduction of DAB in Finland, two additional networks were created with complementing programming and some stations that were not heard in the main Capital FM, such as Voice of Russia in Russian. The BBC in Russian was added and later their news in Russian became part of the YLE Russian output heard domestically. One of the alternative DAB services was all in English, another all in non-English foreign languages. The DAB networks were initially available in the Helsinki area, but were intended to be widened later. DAB, however, was called off for lack of receivers and popularity. See the schedules below. In 2005 the name of the station was changed into YLE Mondo. That name had already been used for one of the DAB special networks. It became available later in the whole country as a radio channel attached to digital television, DVB-T. End of June 2016 YLE ceased airing radio as part of DVB-T, and accordingly also discontinued the national availability of YLE Mondo. Once again, the station became "Helsinki only", on 97.6 MHz (cable 107.3 MHz). The foreign language services of YLE Radio Finland had reassigned in 1998 to be primarily serving the domestic audience though continuing to be available internationally. This meant that early morning broadcasts were created - while the traditional evening times - more suitable for Western European listeners, for example, were abandoned. The English half hour, for example, was now available at 7.30 am and 9.30 am Finnish time, with a morning flavor. The block was rerun during the day for Asia and North America. In 2002 YLE Radio Finland production in English, German and French was discontinued, while Russian remained. The news unit of YLE television had started producing news for TV some years earlier and took over producing news for radio as well. In recent years some broadcasters have cancelled their availability mainly due to changes in their operations. The Canadian CBC and ABC Radio Australia pulled out in 2012. The decision by Deutsche Welle to close down its German language radio channel almost left the station without German output. Contacts within the German public radio system and active interest shown at Yle resulted in NDR (Norddeutsche Rundfunk) making its radio news channel in German available for placement on Yle. A recent addition was as well the airing of the 6 pm main news of Estonian radio on Yle Mondo. Capital FM and Yle Mondo were domestic services of the international radio unit Radio Finland. In 2006 Radio Finland was merged administratively with a domestic all spoken word channel Yle Puhe (formerly Radio Peili) that also became responsible for the domestic foreign language FM. In 2013 the domestic Finnish language network for cultural programming and classical music YLE Radio 1 became the administrative home of Yle Mondo. With the introduction of digital television in Finland (DVB-T) the channel became available all through Finland as a radio channel attached to digital television. The latest phase in the life and times of the station sees it back in Helsinki only. From July 2016 Yle no longer offers radio as part of the digital television distribution. 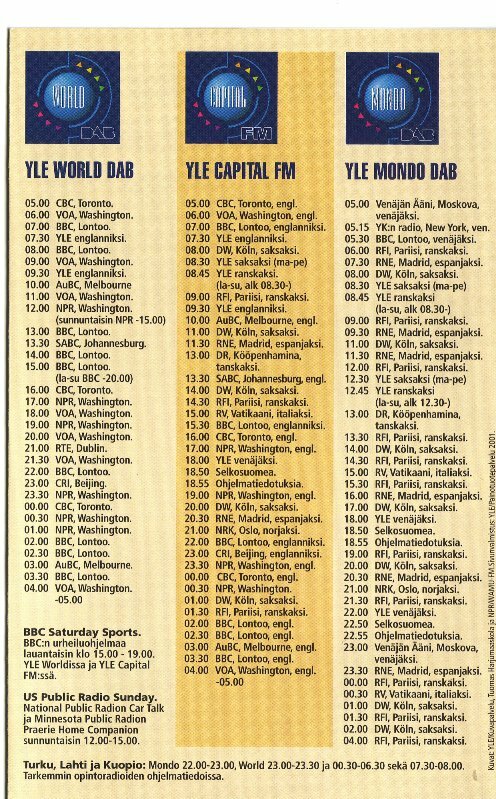 Thus, Yle Mondo (ex Capital FM) is again available in the Helsinki area only on 97.6 MHz (107.3 MHz on cable). The availability of cable is now vitally important as the transmitter strength of Yle Mondo is low and accordingly audibility is poor in parts of the Helsinki metroplex area. Below, the schedules of the time when two digital DAB channels were offered and Capital FM was a selection from that output. 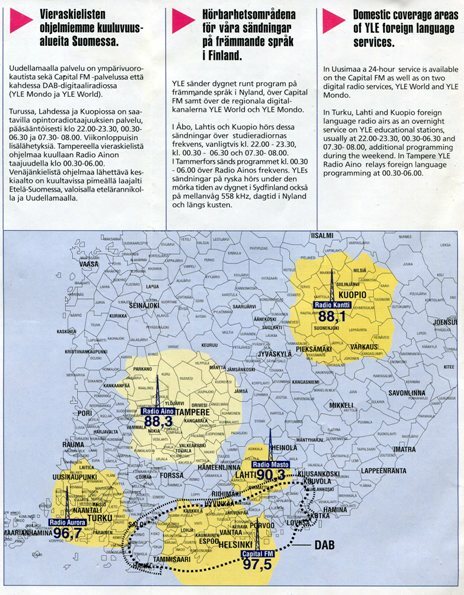 And further down the coverage areas of Capital FM as a VHF service in 2001. Current schedule information is available at, www.yle.fi/mondo. 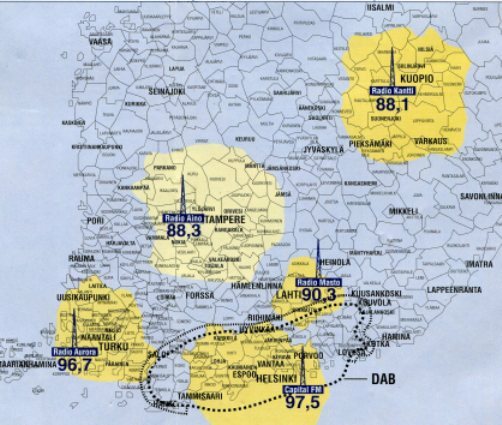 coverage areas on the FM dial in 2001. The map does not include the transmitter in Jyväskylä.